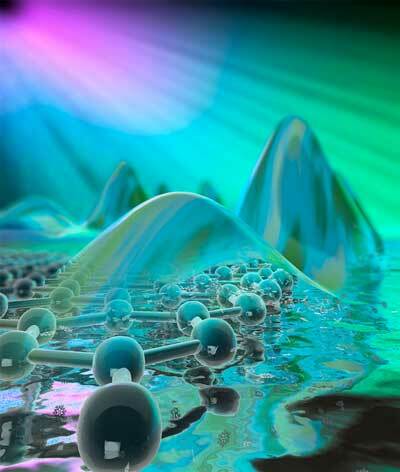 (Nanowerk News) As electronic devices and circuits shrink into the nanoscale, the ability to transfer data on a chip, at low power with little energy loss, is becoming a critical challenge. Over the past decade, squeezing light into tiny devices and circuits has been a major goal of nanophotonics researchers. Electronic oscillations at the surface of metals, known as surface plasmon polaritons or plasmons for short, have become an intense area of focus. Plasmons are hybrids of light (photons) and electrons in a metal. If researchers can harness this nanolight, they will be able to improve sensing, subwavelength waveguiding, and optical transmission of signals. Columbia investigators have made a major breakthrough in this research, with their invention of a novel “home-built” cryogenic near-field optical microscope that has enabled them to directly image, for the first time, the propagation and dynamics of graphene plasmons at variable temperatures down to negative 250 degrees Celsius. The study was published online today in Nature ("Fundamental limits to graphene plasmonics"). Basov, Dean, and Hone bring together years of experience in working with graphene, the one-atom-thick material that is one of the most promising candidates for novel photonic materials. Graphene’s optical properties are readily tunable and can be altered at ultrafast time scales. However, implementing nanolight without introducing unwanted dissipation in graphene has been very difficult to achieve. The Columbia researchers developed a practical approach to confining light to the nanoscale. They knew they could form plasmon-polaritons, or resonant modes, in the graphene that propagate through the material as hybrid excitations of light and mobile electrons. These plasmon-polariton modes can confine the energy of electromagnetic radiation, or light, down to the nanoscale. The challenge was how to visualize these waves with ultra-high spatial resolution, so that they could study the performance of plasmonic modes at varying temperatures. Alexander S. McLeod, a postdoctoral research scientist in the Basov Nano-optics Laboratory, built a unique microscope that enabled the team to explore the plasmon-polariton waves at high resolution while they cooled the graphene to cryogenic temperatures. Lowering the temperatures allowed them to “turn off” various scattering, or dissipation, mechanisms, one after another, as they cooled down their samples and learned which mechanisms were relevant. The study is the first to demonstrate the fundamental limitations for the propagation of plasmon polariton waves in graphene. The team found that graphene plasmons propagate ballistically, across tens of micrometers, throughout the tiny device. These plasmon modes are confined within a volume of space hundreds, if not thousands, of times smaller than that occupied by freely propagating light. Plasmons in graphene can be tuned and controlled via an external electric field, which gives graphene a big advantage over conventional plasmonic media such as metal surfaces, which are inherently non-tunable. Moreover, the lifetimes of plasmon waves in graphene are now found to exceed those in metals by a factor of 10 to a 100, while propagating over comparably longer distances. These features offer enormous advantages for graphene as a plasmonic medium in next-generation opto-electronic circuits. The current study is the beginning of a series of low-temperature investigations focused on controlling and manipulating confined plasmons in nanoscale optoelectronic graphene devices. The team is now using low-temperature nanoimaging to explore novel plasmonics effects such as electrically-induced plasmonic reflection and modulation, topological chiral plasmons, and also superconducting plasmonics in the very recently discovered “magic angle” system of twisted bilayer graphene.